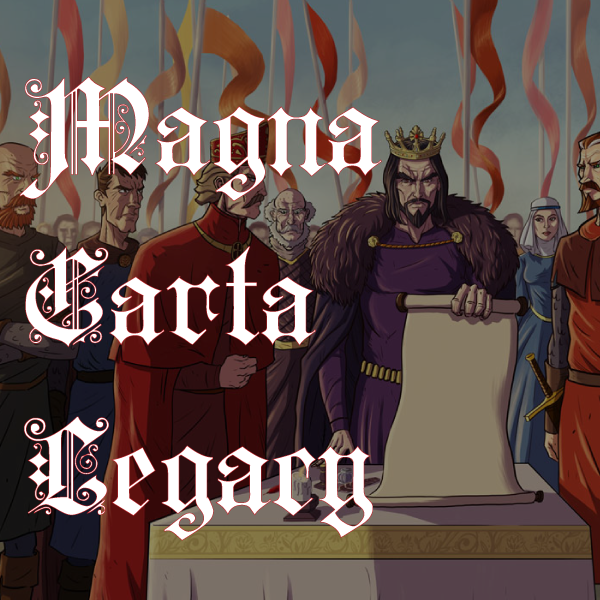 The much anticipated Magna Carta Symposium was held on Thursday 7 May 2015. The symposium was a great success and was booked out a week before the event. 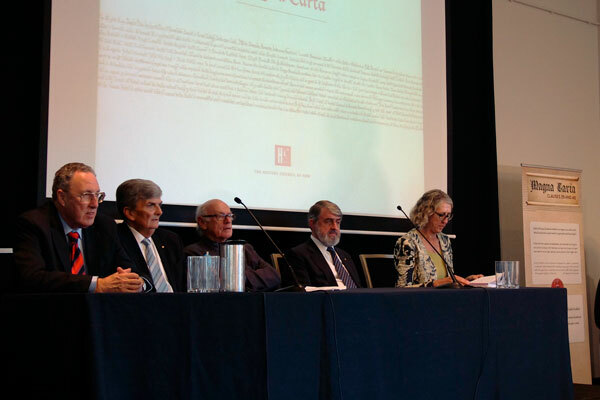 Around 100 attendees packed into the Dixson Room at the NSW State Library to hear from a range of distinguished speakers about the history of the Magna Carta and its relevance today. Dr Alex Byrne from the State Library of NSW welcomed guests to the Symposium and President of the NSW History Council, Emeritus Professor David Carment, was the master of ceremonies and introduced the speakers for the event. Professor Nicholas Cowdery AM QC spoke about the relevance of the Magna Carta in shaping our understandings of the rule of law, separation of powers, democracy, the presumption of innocence, and the concept of no taxation without representation. Symposium speakers (left to right): Professor David Clark, Dr Andrew Think, Professor John Hirst, Professor Nicholas Cowdery AM QC, Dr Rosemary Laing. Professor John Hirst’s paper delved into the legacy of British Rights and Liberties in Australia from the very beginning of European settlement to the goldfields and the Communist Party Case. His paper argued that historians have often overlooked the strength of commitment to British rights in Australia. Dr Rosemary Laing told the story of Australian Parliament House’s copy of the 1297 Magna Carta, which was purchased by the Menzies Government in 1952. Professor David Clark spoke about the mythology of the Magna Carta in the legal sphere, and how it has been misappropriated and used in legal argument in Australia from 1805 to 2015. Dr Andrew Tink provided an interesting account of the early days of the First Fleet in Sydney centring on the story of Cable v Sinclair, the first civil case in NSW where a convict successfully sued a convict transport captain for lost luggage. Dr Tink made the point that some of the principles of the rule of law which we value today developed quicker in the colonies – he said it would have been unlikely for a convict to have been able to bring a civil action of this kind back in England – such was the early colony’s commitment to the rule of law! The Symposium concluded with a panel discussion and questions. There was some discussion about the role of civics and citizenship education in ensuring young Australians understand the importance of and the principles of Magna Carta. Opinion was divided whether we should be cynical or optimistic about younger generations’ knowledge and understanding of government, democracy and the law. All the speakers agreed that there was something special and emotive about the story of Magna Carta which still captures people’s imagination over the 800 years since its grant. A video of the Symposium will soon be available to watch – contact us if you would like to be notified when it is available. 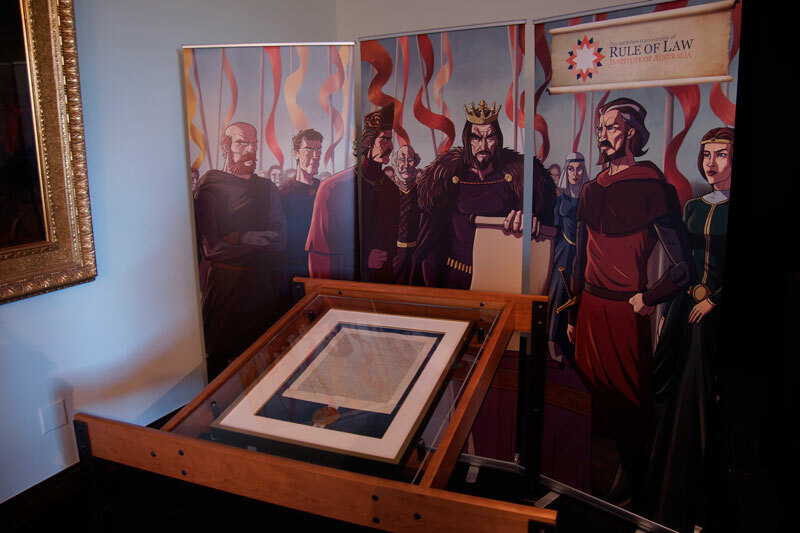 The Rule of Law Institute’s replica of the 1215 Salisbury Magna Carta, with an illustration of King John granting the Magna Carta at Runnymede was on display, as well as an English Statute Book from 1297 which contains a copy of the Magna Carta, a priceless part of the State Library’s collection.